The present invention features a portable sauna system having a bathtub with an enclosure on three sides. The system features a portable sauna enclosure with a U-shaped sauna anterior support, a U-shaped sauna posterior support, and a U-shaped sauna middle support. The sauna anterior support and the sauna posterior support each feature a plurality of suction cups and a foam seal disposed on the sauna anterior support anterior side and the sauna posterior support posterior side, respectively. The sauna middle support features a first rolled curtain on a first spring biased roll, and a second rolled curtain on a second spring biased roll. The sauna middle support features a plurality of suction cups and a foam seal disposed on the sauna middle support second side. The system features a heat source. 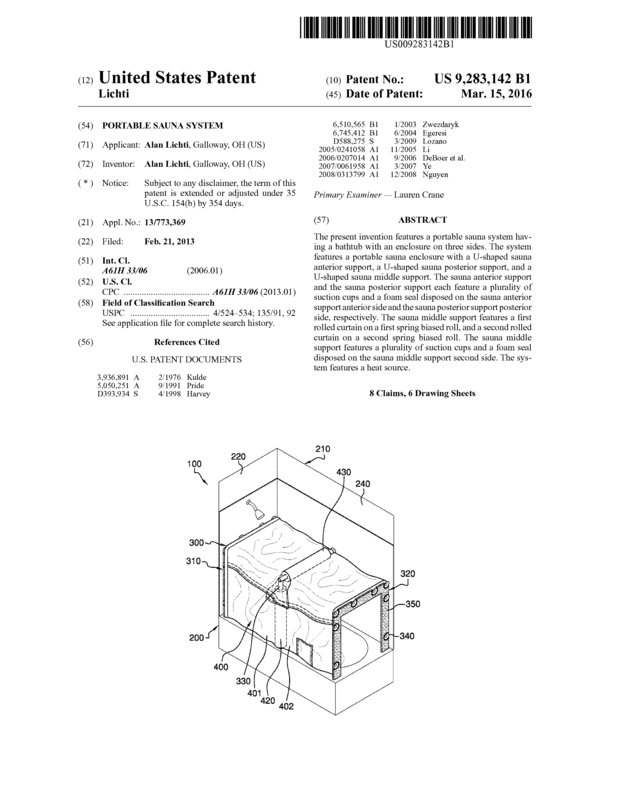 Page created at 2019-04-24 18:04:20, Patent Auction Time.